Blackholes are often described as voracious and monstrous, with sloppy eating habitsthat cause X-rays to be coughed up and spat out willy nilly. Pushingthe dietary analogy a bit further, scientists now say that regardless of where black holes dine, they have thesame culinary habits. Supermassiveblack holes, which anchor many galaxies, feed just like smaller"stellar" black holes, the researchers announced last week. Thefinding supports some implications of Einstein's relativitytheory that black holes of all sizes have similar properties. Theconclusion comes from a large observing campaign of the spiral galaxy M81,which is about 12 million light-years from Earth. In the center of M81 is ablack hole about 70 million times more massive than the sun. It pulls gas fromthe central region of the galaxy inward at high speed. Stellarmass black holes typically weigh just a few solar masses and have a differentsource of food. They pull gas from an orbiting companion star. Inboth cases, when black holes dine, material spirals inward and becomessuperheated, giving off X-rays and other forms of radiation. Researcherswondered if they'd have the same feeding mechanism. A study of the X-rays,optical light and radio waves emitted from the jowls of both black holevarieties suggests they do. 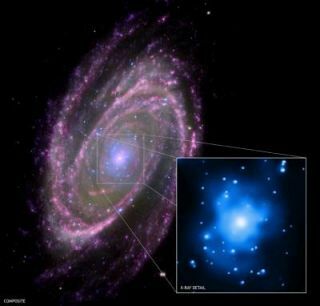 Scientistsused the Chandra X-ray Observatory and multiple ground-based telescopes to takedetailed observations of the huge black hole at the center of the M81 galaxy,and compared these to observations of smaller black holes. They found thatwhile the total energy coming out of the massive black hole was larger, the relativeamounts of energy being emitted at different wavelengths ? from radio toinfrared to X-ray light ? were roughly the same. "Theshape of the light curves looks very much the same," said researcherMichael Nowak of MIT. "The only difference is the total energy coming out.The characteristic energy of the matter and the speeds of the jets all seem to workthe same way. It's just that big blackholes have more matter." Eventhe material falling onto the black hole seems to travel at the same speed,regardless of the black hole's size. But since a more massive black hole has a widerevent horizon, or distance within which matter cannot escape, it takes materiallonger to fall in. "Everythingaround this huge black hole looks just the same except it's almost 10 milliontimes bigger," Nowak said. Thefindings help scientists understand how black holes work on a fundamental level. "Ithink what this is really doing is helping us see the connection betweendifferent kinds of black holes," Nowak told SPACE.com. "Themore we can say that big and small black holes are analogous to each other, itgives us a better idea to understand how black holes eat matter and ejectmatter." Andbecause large black holes are thought to play an important role in galaxyformation and evolution, by learning more about black holes scientists canbetter understand how galaxies came to be, he said. Thefindings will be detailed in the Astrophysical Journal.